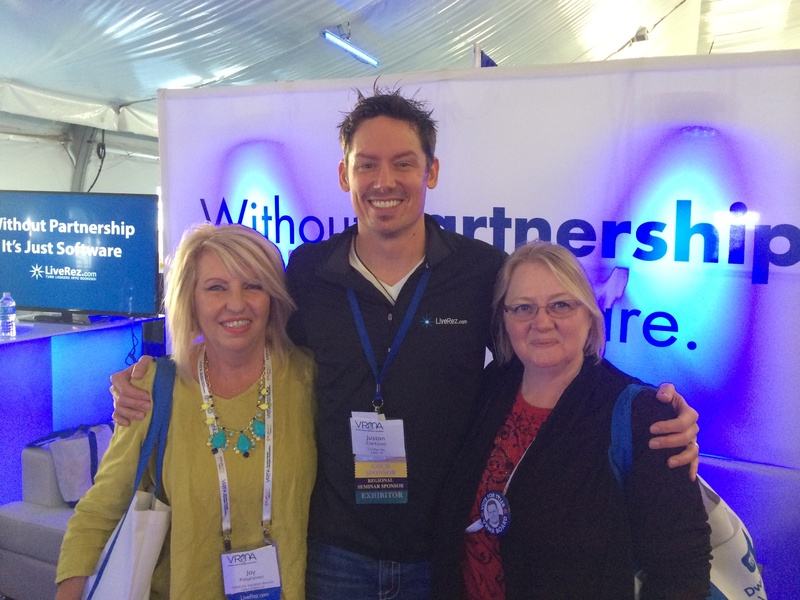 LiveRez's Juston Clarkston with Joy Pohjalainen (left) of Tybee Joy Vacation Rentals and Cynthia Elliott of Cannon Beach Vacation Rentals at the 2014 VRMA Annual Conference. History was made at this year’s VRMA Annual Conference. The 2014 edition of the conference shattered attendance records. In fact, with more than 1,000 vacation rental professionals in attendance, the 2014 VRMA Annual Conference was the largest industry event in history. The LiveRez team was there and out in force. So were LiveRez partners. It was so amazing to be around so many great people and to get to spend time with so many of our partners. LiveRez CEO Tracy Lotz gave an amazing speech to attendees Monday morning, emphasizing the concepts of partnership that LiveRez was founded on. On Monday night, more than 100 attendees came to our LiveRez Partner Reception at the Shoreline Restaurant in the Marina Tower. Congrats to Mill Pond Realty, winner of our Bose Headphone giveaway at the reception. On Tuesday, LiveRez’s Tyler Hurst gave a well-attended presentation on closing bookings over the phone with LiveRez partner Lyndsey Garza of Pointe West Properties. Tuesday afternoon, LiveRez gave away two big-screen TVs. Our big winners were Seabrook Cottage Rentals and Sandpoint Vacation Rentals. For more updates on how the conference went, follow the #VRMA2014 hashtag on Twitter, check out our photo gallery (below), and see our own social media coverage on LiveRez’s Facebook and Twitter accounts.